AUSTIN, Minnesota -- A Minnesota high school basketball player is being hailed as the team's hero after he scored a shot made from the other end of the court just as the end-of-game buzzer rang, according to ABC News. The epic shot was made by Austin High School junior Oman Oman, 16, who helped the team win by just one point against Northfield High School Tuesday night. The final score was 57-56. "It was a tough game at the end," Oman told local newspaper Austin Daily Herald. "We definitely stole one from them." The stunning play happened within the last three seconds of the game, the Herald reported, adding that Northfield was ahead by two points. 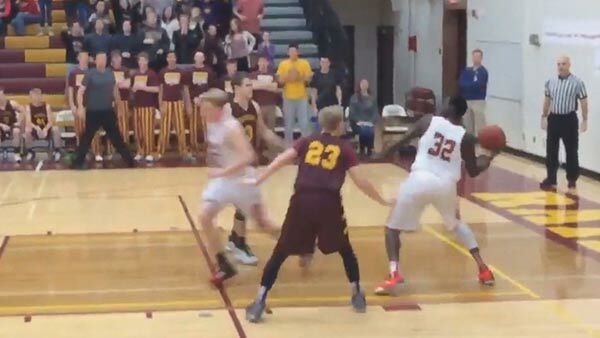 A Northfield player missed a free throw, Oman then grabbed the defensive rebound and flung the ball with one arm to the other end of the court, according to video of the play sent to ABC News by audience member Sylvia Knig. Basketball player Oman Oman for Austin High School in Austin, Minnesota scored a shot made from the other side of the court just before end-of-game buzzer rang on Dec. 8, 2015. The ball went right through the net, and the crowd roared as some members of the rival team fell down in disbelief. "It was just a reaction," Oman told the Austin Daily Herald. "I just got the ball, and I threw it up. Luckily, it went in. It kind of surprised me." Watch the game-winning shot on ABCNews.com.